The Start menu is gone, no longer a part of Windows. Instead, your starting point will be the Metro interface Start screen, comprised of smart "tiles" that act like desktop shortcuts and can contain all sorts of information related to a program, such as listing your latest email messages, upcoming calendar appointments, or incoming chats. If you’re in the desktop interface, either by choice or because you opened a desktop app, returning to the Start screen isn’t intuitive. To get back to Metro, open the Charms Bar by either swiping in from the right edge of a touch screen or moving your pointer to the lower-right corner. From the vertical menu that appears select the Start icon which will take you to Metro’s Start screen. Some of your apps are shown as tiles on the Start screen. If you don’t see what you need there, open the Charms Bar and select search. This will reveal an Apps screen that you can scroll or swipe through, or you can type within the search bar to see apps and other content related to your search. In the desktop interface, closing apps is the same as in previous versions of Windows. You can choose Exit from the File menu, or use the Close button (red ‘X’ in the title bar). 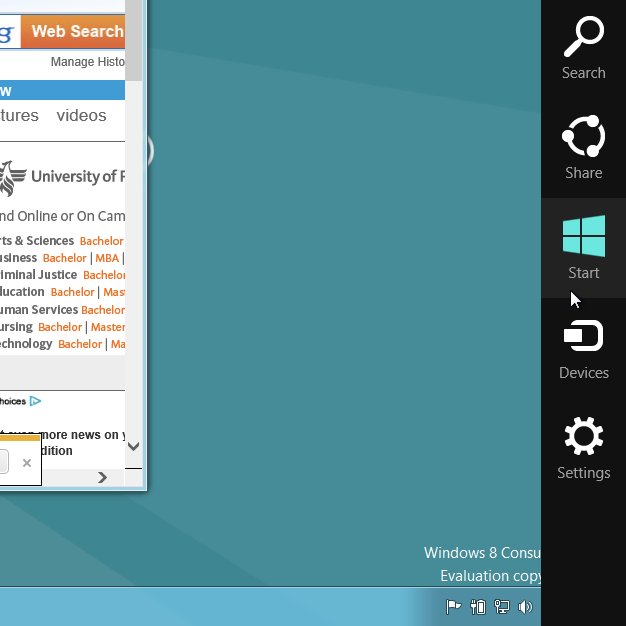 Metro apps don’t need to be closed, as Windows 8 manages them in the background in a Suspended mode. If you do want to close one anyway, on a touchscreen device you can drag in and back out from the left edge of the screen to reveal a list of running apps, then drag the icon for the app you wish to close to the bottom of the screen. Or, with a pointing device, move to the lower left corner to reveal your last used app, then move your pointing device up the left edge of the screen to reveal a list of running apps. Right-click and choose Close on the desired app. Windows 8 is designed to behave more like a smartphone or tablet than a PC, simply going to sleep when it’s not being used. 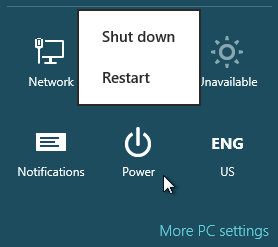 If you do want to shut down, or have a need to restart, open the Charms Bar, select Settings, and then the Power button, which will reveal the Shutdown and Restart commands. If you regularly use web apps that rely on plug-ins, you may wish to set the desktop version of Internet Explorer as your default. To do this, select the Desktop tile from the Start screen, then the Internet Explorer icon from the Taskbar. Use the Tools icon to reveal Internet Options. Go to the Program tab where you’ll find a dropdown menu with the option to open links Always in Internet Explorer on the desktop. Also, check the box below the dropdown to Open Internet Explorer tiles on the desktop.